UDON Entertainment has revealed a huge History of Sonic hardback book for launch in North America this September. It's the same book as Pix'n Love Publishing announced for Europe, though it doesn't look like North America will get the cool embossed gold foil cover. The book itself spans nearly 300 pages and has been produced in conjunction with SEGA Japan, with developer interviews, concept art and more. The asking price for this slice of hedgehog history? A mere $49.99 when it hits in September. Or pre-order it from Amazon for $31.81. One of gaming’s classic characters gets his first-ever art book retrospective in a massive new tome from UDON! TORONTO: Celebrating more than 20 years as the official mascot of video game giant SEGA®, Sonic the Hedgehog is one of the most recognizable video game characters in the world! With over 70 million games sold, hundreds of episodes of his TV series, countless licensed tie-ins, and a comic book series that’s been running non-stop since 1993, FANS KNOW SONIC, and now UDON has teamed up with Pix’n Love Publishing to bring fans the ultimate guide to SEGA’s spiky blue speedster— The History of Sonic the Hedgehog! The History of Sonic the Hedgehog is a hefty 300-page hardcover book debuting this fall, featuring everything you thought you knew… and much more… about the famous “blue blur!” The book has been a true labour of love for the crew at Pix’n Love Publishing, who partnered with SEGA of Japan to produce the original French edition earlier this year! The new UDON Edition of The History of Sonic the Hedgehog features all the same great content, but with a complete English translation for North American fans! The History of Sonic the Hedgehog covers every 2D and 3D Sonic game in detail, ensuring that every generation of Sonic fan will find a lot to love! The book also details every spin-off game, every crossover, and even rare cameo appearances by Sonic across the gaming universe! Whether you’re looking for a detailed history, character profiles, promotional art, game packages, or even rare concept art, you’ll find it in The History of Sonic the Hedgehog! 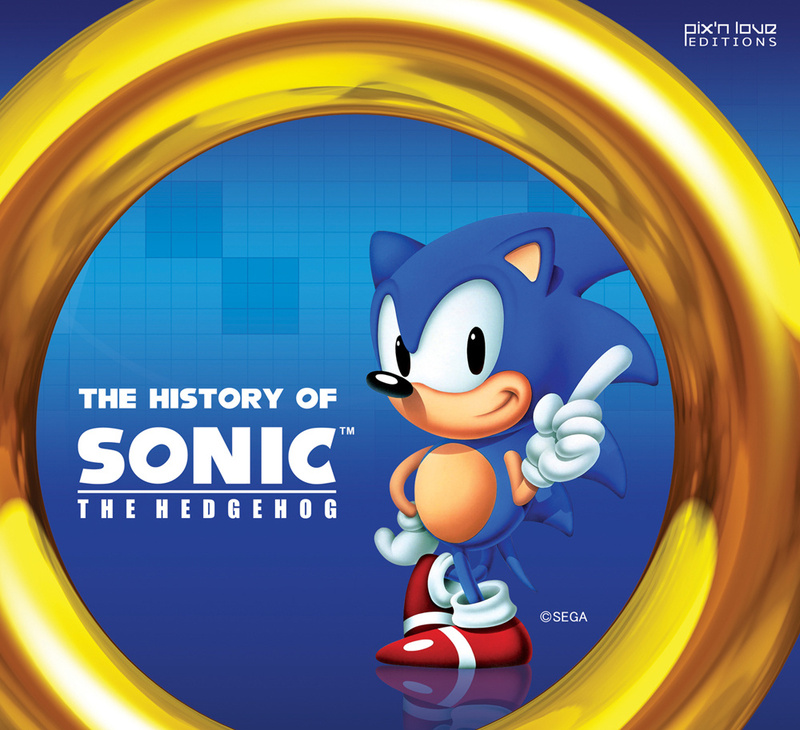 The History of Sonic the Hedgehog is the book that fans of this series have been waiting for, and whether you’re an avid gamer, a Sonic comic reader, or just have fond memories of this series, you’ll want a copy on your shelf! Beautiful 300-page hardcover collection in a unique “widescreen” format. Sonic’s longevity and popularity is rarely matched in video games! He’s appeared on more than 15 video game systems and in more than 100 games, including the recent fan-favorite Sonic Generations for PlayStation®3 computer entertainment system and the Xbox 360™ video game and entertainment system from Microsoft! The Sonic the Hedgehog video game series’ covered in this volume have sold more than 70 million units! The Sonic the Hedgehog comic line from Archie has been running non-stop since 1993, with over 300 comics released! Sonic has also appeared in manga, novels, picture books and even colouring books, but this is his first-ever art book appearance! Click here to pre-order The History of Sonic the Hedgehog through Amazon. This is nice to hear. A book like this would be neat to have on the coffee table. Good news for the 12 people who actually care about Sonic! It's about time sonic gets some love after sonic 06', all of those sonic haters and whiner fanboys. @James There was a European version of the book too. Well the 2000-2010 section will be pretty short,with all those brilliant Sonic games released then. If this includes Nack the weasel in at least ONE PAGE, I will buy it instantly. Looks awesome! I think I'm most interested in reading about the Sonic Adventure games. $50 bucks for a book? In 2012? In America? And it's specifically about Sonic? HAHAHAHA! Watch this book get very little sales. This is cool though. Would love to read just so I can see how they react to the bad stuff such as Sonic 06. 50 Dollars? Maybe I'll get it as a present. If not, I'll buy it myself, ANYTHING FOR SONIC! I like Udon entertainment, I have a lot of their Capcom artbooks so I might add this to my collection. @Luigivaldo Good spot! Have inserted that link into the story now. Nearly $20 off is a great saving! And take all my rings. Maybe we can pinpoint where the franchise started to sink. My wallet is going to scream in agony. Will the History of Nintendo series come out here? I want the G&W volume. I have both french version of this book and I can tell you it's fantastic !! Amazing news! haters can go screw themselves for all I care. SHUT UP AND TAKE MY RINGS! If half the book is dedicated to the freaking Archie comics, I'm going to throw it at someone. Gotta buy an Amazon Gift Card soon... I won't miss out on an opportunity like this. ... The seiries as a whole is awful, and I won't buy the book. I'm so going to get this!